Being true to yourself is the beginning of confidence. In a world of imitators and unjustifiable judgments, being able to wholly embrace yourself for the unique individual, you are is a powerful thing. As a woman, there is no better feeling than when hair, makeup, and outfit all come together to create a beautifully cohesive look. As a woman who can no longer see, the feelings are identical. Lack of eyesight does not and should not prevent anyone from feeling and looking their absolute best. Begin with a firm foundation – Know who you are, hone your strengths, and do not compromise your principles. Plan, plan, plan – Plan your wardrobe, cosmetics, and accessories. Having a rough idea of your favorite ensembles and what to pair them with makes getting ready for the day easier by eliminating the “what to wear” stress. Throw on some of your favorite music & let the magic begin – Never underestimate the power of music. Remember – Underneath the shiny exterior is one of the most beautiful people in the world and no one else is like you! My favorite color combination black & white in this case was a black off-shoulder long sleeve choker top, white boyfriend jeans, black high-heeled pumps. Silver-tone accessories included a long crystal embellished necklace, earrings, ear cuff, cuff bracelet, and white cane. At the end of the day we can look ever so good on the outside but if there is nothing beneath the exterior we are no more than fancy looking shells. 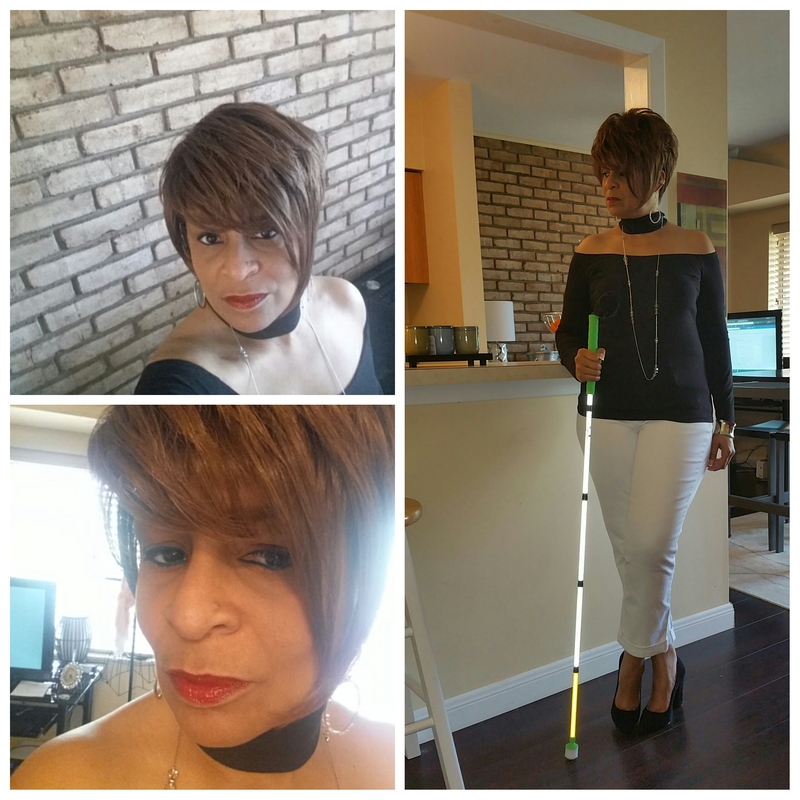 A tri-collage of two selfies to the left of a full image of me posing while standing with my white cane. Steph, I think you have good taste. Perfect look for you! I have a feeling you are not “am empty shell” from your posts – beautiful inside and out! Your insides do make a huge difference in how you are perceived by others. Thank you so much!! My grandmother would be so disappointed if I were an empty shell because she raised me better than that. I’m nowhere near as intuitive as she was where people are concerned, she was less concerned with outside appearances and placed her focus on the heart. She sounds like a wonderful lady. She was and even though it’s been 21 years since she died I still miss her but carry her values inside. And a beautiful woman you are!